It still looks a like a work in progress but perhaps that is what a pop-up restaurant has to feel like. 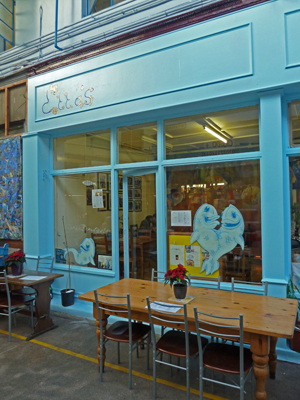 The interior is bright and cheerful with a new mural of giant fishes. We think the menu has changed a bit and the food has certainly improved. We chose the fish and chips, and ackee and saltfish. The fish was definitely in Etta’s tasty batter (light with some pepper or cayenne) and all the chips were crispy. 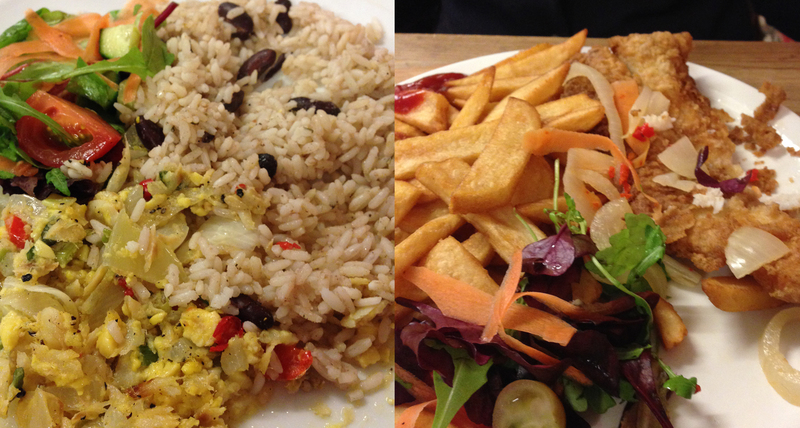 The ackee and saltfish came with rice and peas making it a truly Caribbean restaurant. There was not much ackee and not much saltfish and quite a lot of onion but was nevertheless tasty. Perhaps not a patch on homemade. There is no alcohol but they offer fresh sorrel or fresh ginger beer. For alcohol – you bring your own the do provide appropriate glasses so wine doesn’t need to come from a tumbler. But for this service they charge one pound fifty. We were under pressure to make the start of the play at Brixton East so we were nervous about the previous slow service. But we ordered, ate and paid and still had time for the glass of wine at the theatre. If you want a relaxing time, lingering over each course we are sure that it will be a possibility. In fact the restaurant staff were worried about our swift departure and interested in where we were going – so still they were as friendly as ever and we did have a jolly time.